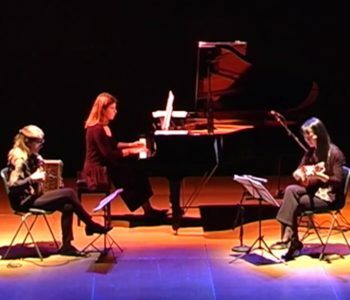 The Ankordis Trio is composed of Miki Nishiyama (mandolin), Giuliana Ferraboli (diatonic accordion) and Cetti Schinocca (piano). The Ankordis Trio has recorded their first CD Pizolla in 2017. A new CD is in preparation. Bovegno, chiesa di San Rocco, 23 settembre 2018. You can also find more pictures and videos in the facebook profile of Ankoris Trio. I have discovered the Trio Dhoore from a mixcloud podcast about the Celtic Connections 2018 in Glasgow. Trio Dhoore has played at the important folk festivals and has just finished a tour in Austria. Endless Dancing is the most popular track from their last CD Momentum. I have compiled a playlist with the best tunes by Trio Dhoore – Enjoy! Euan Morrison compiles a weekly one-hour Folk Show on Aberdeen Student Radio, the show is available on Mixcloud. YOu can always discover interesting bands and tunes in this podcast! 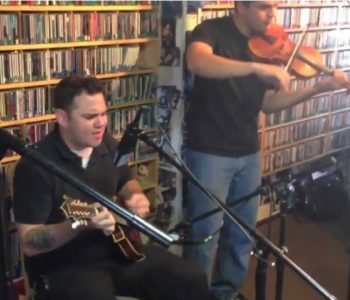 An hour of the best folk and acoustic music from Scotland and beyond, With Euan Morrison. Tracklist and more: www.curlypiper.weebly.com/folkshow. In only five years and with three full albums, Trio Dhoore have launched themselves a top Flemish folk export. 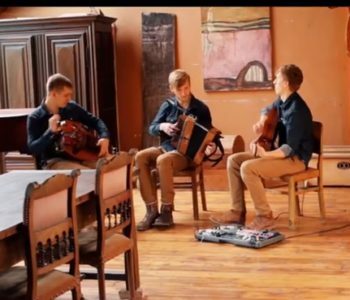 They blend traditional music from Flanders with their own style to create an energetic sound that will make you sit on the edge of your seat. Their “rooted folk music” breathes life, freedom and energy into a repertoire of traditional Flemish tunes (and the occasional song) and their own self-penned material. They create an immersive soundscape where folky grooves, melancholy melodies and intuitive interplay combine to unique effect. 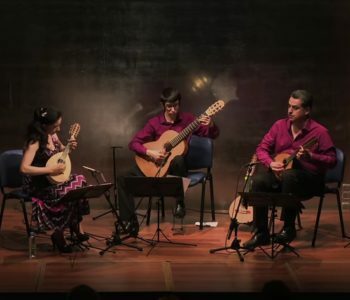 A concert with the Duo AREKIPE – Ricardo Sandoval (Venezuela) and Kathy Lasso (Colombia) – has recently been added to the youtube channel of Ricardo Sandoval. The guitarist Matthias Collet joined the duo for this concert. You can hear a nice program of duets and trios for mandolins, bandurrias (or bandola andina) and guitar. Concierto de Duo AREKIPE (Kathy Lasso & Ricardo Sandoval) con Matthias Collet.